Fertilizer and manure containing phosphorus help crops grow, but when phosphorus runs off into surface water it can lead to algal blooms and dead zones, damaging water quality for people and wildlife. Current conservation programs aim to reduce water pollution, but do not quantify reductions or track water quality improvements. 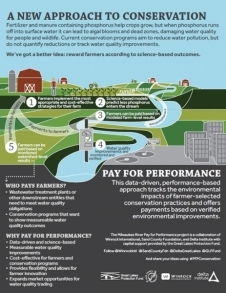 We’ve got a better idea: reward farmers according to science-based outcomes. Download this infographic to learn more about how Pay for Performance works.